Slice the 4 chicken breasts in half lengthwise. Cover with plastic wrap or place in a plastic zippered bag. Pound each slice to about ⅛-inch thick to tenderize. In a large, oven-safe or cast iron skillet, melt 2 tablespoons of butter over medium-high heat. Sauté the mushrooms until golden-brown (about 5 minutes), stirring often. Set aside. Add 2 more tablespoons of butter to the skillet. Place flour on a dinner plate. Dredge the chicken pieces in the flour to coat. Cook chicken with the butter over medium-high heat for 3-4 minutes per side, until golden-brown. Remove the chicken from the skillet, leaving the drippings. Add the last 2 tablespoons of butter and chicken broth. Bring to a boil, scraping up all the chicken bits. When the liquid begins to thicken, place the chicken back into the skillet and turn each piece to coat with the liquid. Pour the mushrooms over the top of the chicken. Turn off the heat. In a bowl, mix together both cheeses, green onions, salt, and pepper. 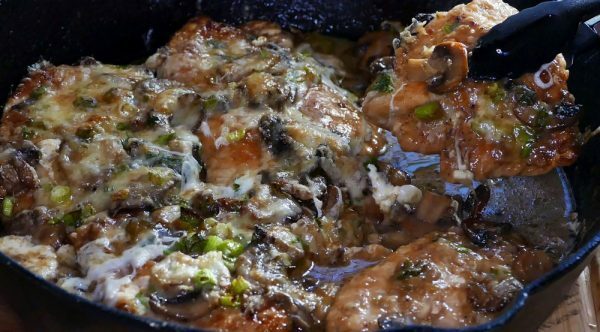 Sprinkle the cheese mixture over the chicken and mushrooms, and bake at 425°F for about 12 minutes, or until the cheese has melted and slightly browned. Serve with rice or pasta.